Global Asia Blog | Brazil vs. Germany: Environmental issues! Imagine, you live in Germany and you suddenly hear that your country has made an environmental agreement with Brazil. Would you be surprised? Why would your country make an agreement with Brazil, a country which is not even close to yours? Let’s find out! First, we will start by discussing the environmental issues in Brazil and Germany itself and which challenges they are facing. 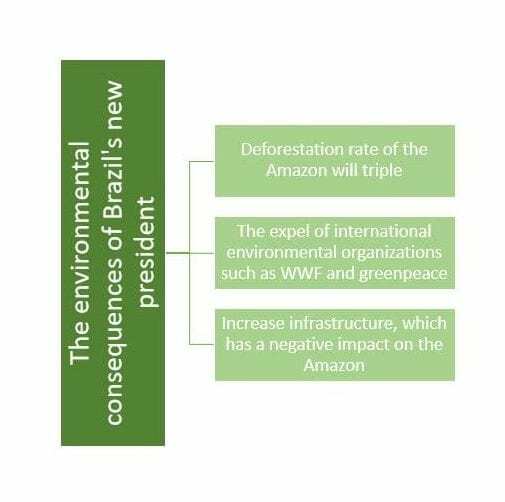 Brazil is currently facing several issues concerning the Environment. To start with the fact that Brazil is the owner of the world’s largest rain forest, the Amazon River Basin. This rain forest is home to many plant and animal species, but also many species that have yet been discovered. 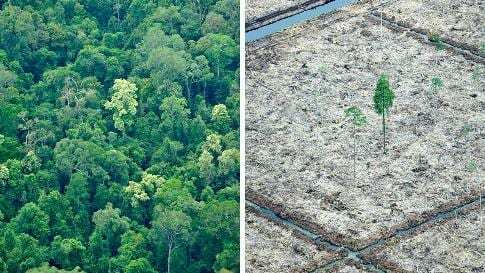 Unfortunately, this beautiful rain forest has also experienced deforestation in the last years. This is the consequence of the expanding of the agricultural industry in the country. Brazil even had once the highest rate of deforestation in the world. The two main trade products of Brazil are soy and cocoa and the demand is high. To make sure that they could offer such large amounts of these products to balance the demands, the farms had to be expanded and this would be at the expense of the rain forest. 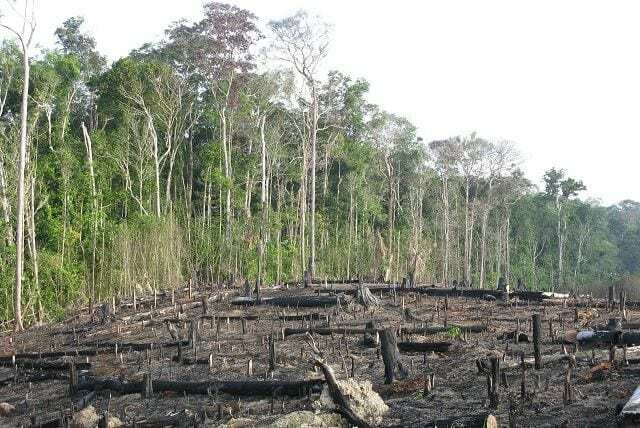 According to the World Wildlife Fund (WWF), 90% of the Atlantic Forest ecosystem in southern Brazil has been wiped out due to the cocoa boom of the 1970s. Another issue in Brazil are the endangered species. Because of the good weather conditions in Brazil, it has always been the home to many plant and animal species. But people started hunting in the woods and new and foreign species were discovered. This led to a big decrease of the rich nature and animals of Brazil. In this exact moment, there are many different species living in Brazil under the threat of extinction. This means that many of these animals can be totally washed out in several years. Some of the animals which we are now talking about are the jaguar, the sea turtle, black-faced lion, ring-tail monkey and many more. 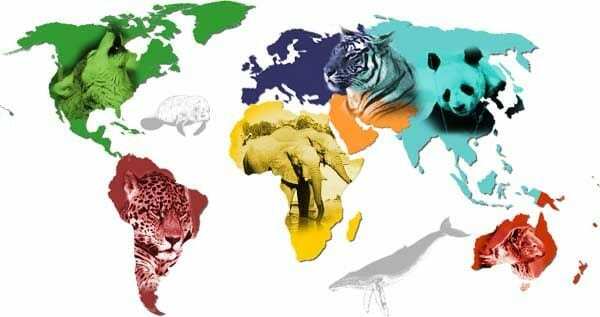 As can be seen in this picture, Brazil is one of the leading countries when it comes to endangered species. 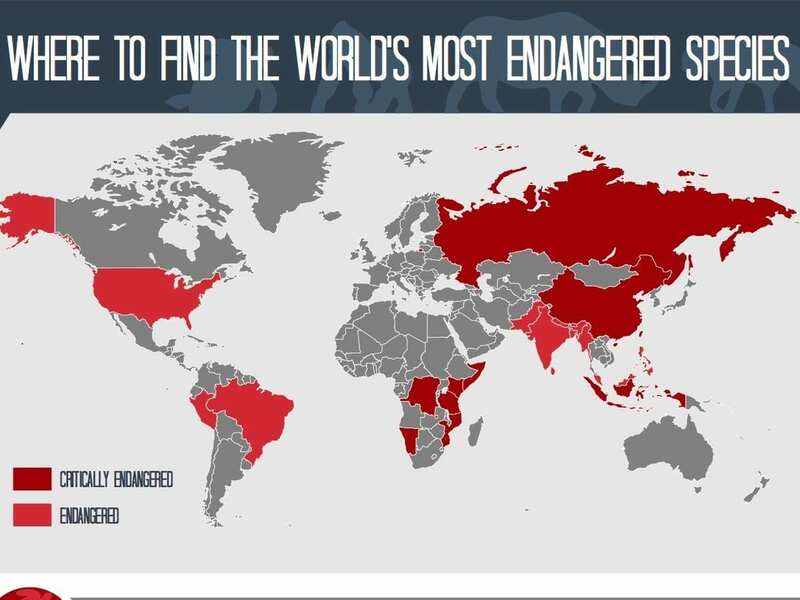 Which animal is endangered in which country? So, to get back to the part where we were talking about the introduction of new and foreign species. Because how is the introduction of new species a threat for the environment? Let us try to explain this to you. When foreign species enter an environment like Brazil, they will most likely cause shifts in the balance of the eco-system. This will say that there is a change that they eat too much, they need place to grow which will be at the expense of existing plants. Also, they can move into new patterns or become a prey to other animals which leads to the fact that these animals will have to adjust to a new living style. Let’s move on to another, very impactful environmental issue in Brazil and maybe one of the most dangerous ones: air pollution. To start with some facts. Air pollution kills about 49.000 Brazilians each year. Around half of these deaths are caused by outdoor pollution, which is mainly found in cities. The other half of the deaths is caused by household air pollution such as cooking with wood and other solid fuels. When we put all these deaths together, a fact is that air pollution represents one in every 26 deaths from all causes in Brazil. But how can air pollution lead to death? Well, the smoke which we breathe in everyday contains tiny particles which can lead to lung diseases, heart diseases and acute infections. 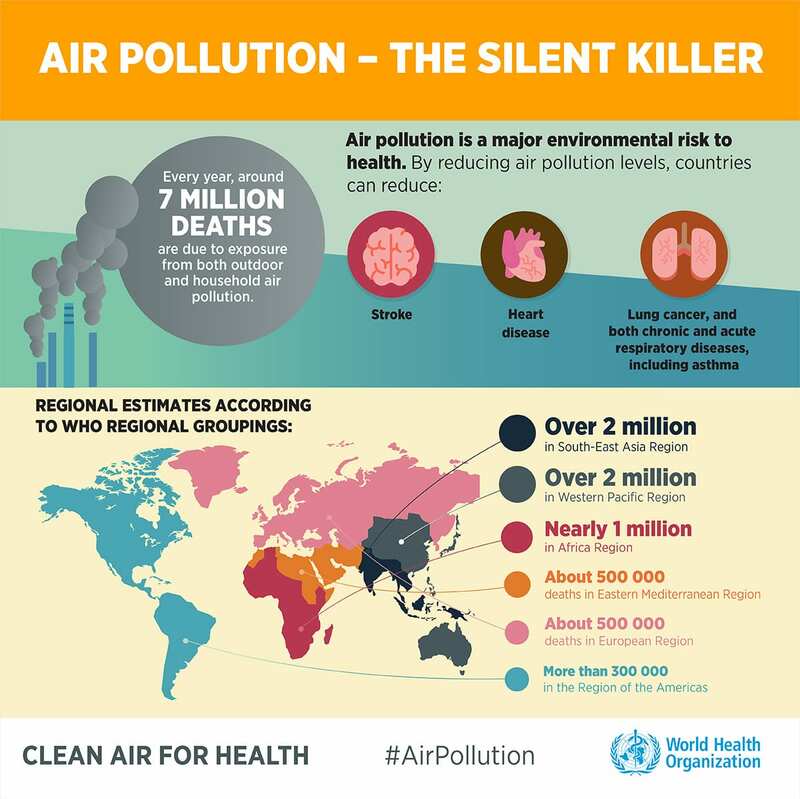 The issue of air pollution is obviously not only happening in Brazil, worldwide it is causing over 6 million deaths per year. And to get back to the part of indoor air pollution, there has been done some research on this topic. Found was that 19 million Brazilians (which is 9,5% of the population in Brazil) cook with firewood and also many other households use wood as a secondary fuel. Concerning these households, the risk to get air pollution is 10 times higher than in towns and cities. 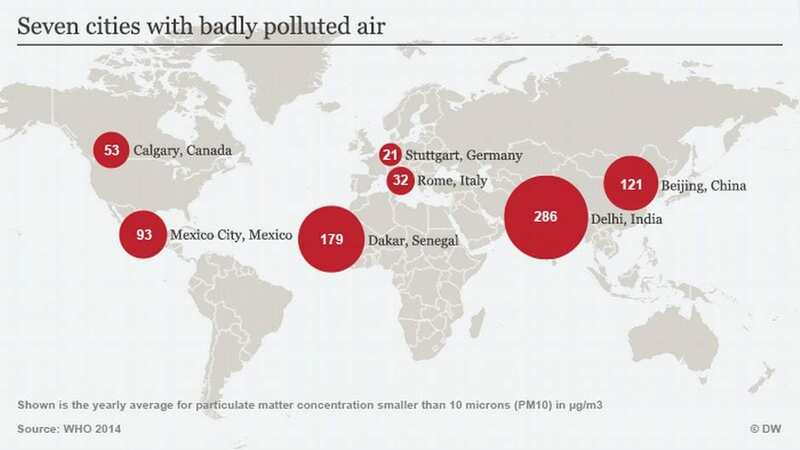 But Brazil is not even the worst country when it comes to Air pollution. 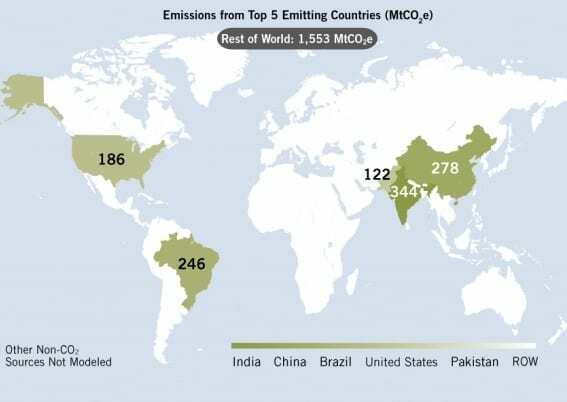 When you take a look at the following picture, you can see that the amount which air pollution causes is in a few countries much more then in Brazil. Last but not least, waste is a very big issue in Brazil. Brazil produces massive amounts of solid waste each year. Of the 161.000 ton of waste they produce per day, only an amount of 2% is recycled. In Brazil, only 62 percent of the population has access to garbage collection and that means that recycling is very hard to do. All this waste that they produce which is not recycled, will finally end up in the streets. Also, the waste has reached the Brazil landfill and that makes the area of the ground toxic. Other dangerous materials like oil, tires and pesticides have also caused some major environmental problems already. Also, Brazil has a new president since last year. We are talking about Jair Bolsonaro, who is also called “The Trump of Brazil”. But have there been consequences for the environment since he became a president? You can see the consequences in the table below. To conclude, Brazil is not a really leading country when it comes to environmental challenges. They are facing many issues namely deforestation, existence of endangered species, air pollution and a waste problem. In our opinion, Brazil is not doing enough. They are doing several things but they can really do much more. Brazil is in charge of a very good legislation on environmental protection and sustainability. They also have laws which are related to the forests, waters, and the wildlife which are in effect already since 1930. But on the other hand, they did achieve the goal of decreasing the amount of deforestation in the Amazon rain forest. But still, Brazil is not doing enough when looking at the many environmental issues they have to face. But what can they do to fight these problems? Or are they already working on proper solutions? Let’s find out. Germany is a country, which is very conscious of the environment. Germany uses a lot of renewable energy or citizens have solar panels on their roofs. Renewable energy is energy that is collected from nature, such as sunlight, wind or rain. 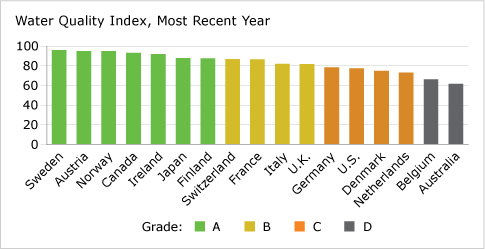 In fact, a decade ago Germany was seen as a global environmental leading country. When looking to the environmental issues in Germany there are some aspects they can and have to improve. Germany has limited land, air and water in which to bury and dispose all the toxic waste, which is produced by the huge industrial development in Germany. Germany has a significant air pollution problem because of the industrial development. Unlike other western countries it has worsened in recent years. After the Fukushima nuclear disaster of 2011 – A serie of ongoing equipment failures, reactor meltdowns and releases of radioactive materials- Germany adopted a policy of removing nuclear power. The outcome of this resulted in a shortage in energy and Germany was obliged to use coal. Coal is one of the most polluted materials in the world and as a result the air pollution level in Germany became one of the highest in the world as you can see in the picture below. Next to the problem of the air pollution in Germany, water pollution is another issue they face. During mining days, the areas around the mine were drained of water, but now as the mines are no longer used, water levels have risen and caused a brown sludge to start filling up the Spree River. The Spree River is a river which flows through Berlin, the capital city of Germany. The result of filling up the Spree river with the brown sludge is killing the wildlife in and surrounding this river. As more countries have to face the rising temperature as a result of the global warming, Germany faces this issue to. 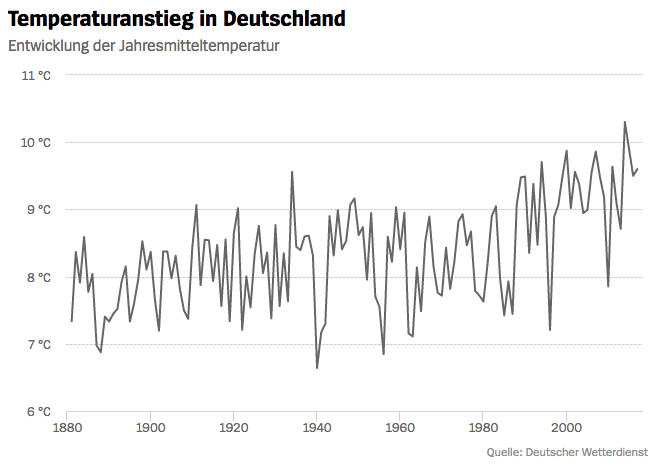 Germany has seen its number of extremely hot days increase across the last several decades. This is a huge issue for Germany as a big source of income comes from the tourists who visit the Alps every winter to ski. 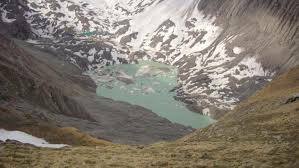 It will mean the end of the Alps, because of the higher temperatures the Alps will melt away and can cause floods at any time in the year. Those dry summers are a major concern because below average rainfall naturally increases the chance and duration of forest fires. This drought is again a big concern for the Alps. As the snowpack is melting earlier and the warm summer temperatures began earlier than before, the chance on a forest fire is bigger than ever before. The result is a much longer than usual period of time when the forests are vulnerable to fire and with less rains it is harder to stop these fires once they begin. Here you can see the evolution of the temperature in Germany, until the year 2000. This is only increasing. As a result of climate change insects travel farther and farther and will be spreading diseases, which is a big concern in Germany as well. Due to the increasing temperatures the disease carries – which are called vectors – they can migrate into new habitats. The mild winters increase the survival rate of many of these disease vectors. 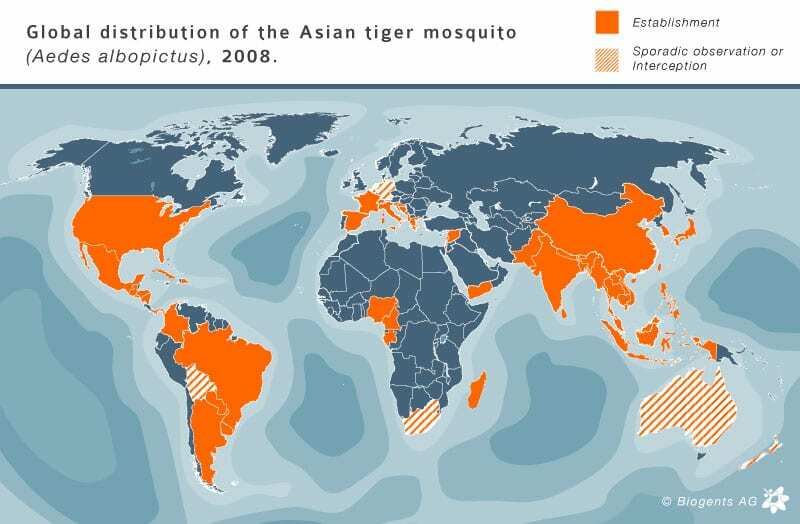 In some regions in southern Germany even the Asian tiger mosquitoes are spreading. Asian tiger mosquitoes can transmit chikungunya fever, dengue fever and zika fever. Furthermore, direct health effects such as asthma and allergies can be occur caused by the higher ozone concertation which includes more irritation. Another issue what concerns Germany is that food may become harder and harder to grow in many places. Fresh drinking water can become more and more scarce, as this is already the matter in some countries. Or basically drought and warming combined together will simply dry up all the natural resources. Yet an issue what seems small, but is not the case for Germany are tourists. Do not think about the tourist in the Germany self but about all the vehicles full of tourist crossing Germany to go for instance to Austria or France. All these gasses contribute to the climate change and affects the ozone layer. We have to keep in mind that even the small things are contributing to ruin our world. To sum up the issues Germany faces concerning the environment are: air pollution, water pollution, extreme temperatures, flooding, drought, public health, food and water security. When looking at Germany, they are doing already many things to go against their environmental problems. They are conserving energy for a more efficient future and they encourage their habitants to use other kinds of transportation. Therefore, Germany is way more driven to fight their environmental issues than Brazil at this moment. 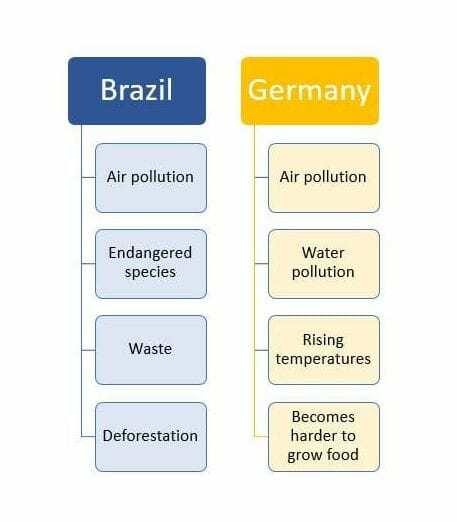 To compare Brazil and Germany there is a similar environmental issue they face, which can also be seen in the overview above. Brazil and Germany both have to deal with air pollution. 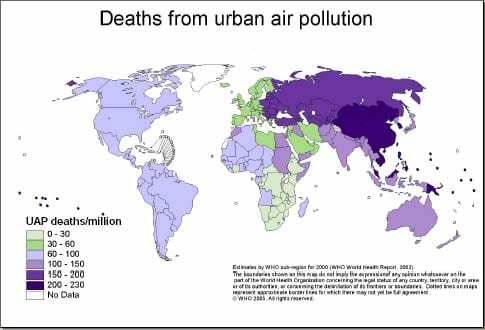 When looking at the picture which you can find below this text, you see a world map concerning how many deaths air pollution has caused in which country. You can see that Brazil is light blue coloured and Germany green. This means that the air pollution in Brazil is worse then in Germany because it has costs more deaths in Brazil than in Germany. How about the other environmental issues and why are they cooperating together if they have only one common issue? Has the extinction of the endangered species and their change in habitat something to do with the disease spreading vectors who enters Germany? If you want to find out, keep reading! The agreement between Brazil and Germany. Angela Merkel (Chancellor of Germany) and Dilma Rouseff ( former president of Brazil), have made an agreement to collaborate on deforestation and clean energy generation. The agreement is designed to line up the two countries climate policies more closely, to build up the climate change matter and the environmental issues which are highlighted. The German government has financed 550 million euros for environmental and clean energy projects in Brazil. Why does Germany do this instead of first improving their own environmental issues? Or is this just a diplomatic agreement for both interest? The Brazilian market is a fundamental importance for the German industry. Germany invested in the first Brazilian industrial development and the creation of this was the beginning of the internationalization process of German companies in Brazil. Can we conclude out of this that Germany only invested such a huge amount of money in Brazil for their own based companies? We think so! The 1600 German companies which are mostly based in São Paulo account for 8-10% of the Brazilian industrial Gross Domestic Product (GDP) and generate more than 250,000 jobs for the citizens of Brazil. The GDP is a measurement of the market value of all the final goods and services produced in a specific period. So basically, São Paulo is the largest German industrial city outside Germany. Next to these investments of Brazilian, companies in Germany have also been expanding. To add that Germany is the biggest Brazilian trading partner in Europe, we can conclude that it is all about the economic relationship and not about the environmental issues. Brazil is one of the world largest greenhouse gas emitter, that is why the support of Brazil to imporve the environment is crucial. Mostly greenhouse gasses come from industrial areas. So, can we conclude that Germany is investing in the environmental issues of Brazil to save their own based companies in Brazil? When the industry in Brazil will produce too much greenhouse gasses, some companies could be shut down including the companies from Germany based in Brazil. This answers our second question as well. Why are Germany and Brazil working together if they are not even neighboring countries. 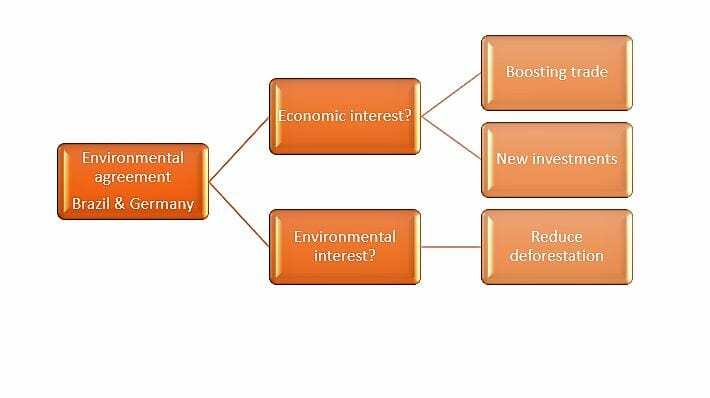 First we concluded that they really want to fight for the environment, but after doing some more research we found out that in the end it is all about the economic interest. If Germany has to shut down their companies in Brazil it will affect the economy of both countries. Which interest would you choose if you were the president from Brazil or Germany? Tagged Agreement, air pollution, Brazil, Climate Change, Deforestation, Economy, Endangered species, Environment, Germany, Public health, Rising Temperatures, Waste, Water pollution. Bookmark the permalink.